Skinner, Inc. 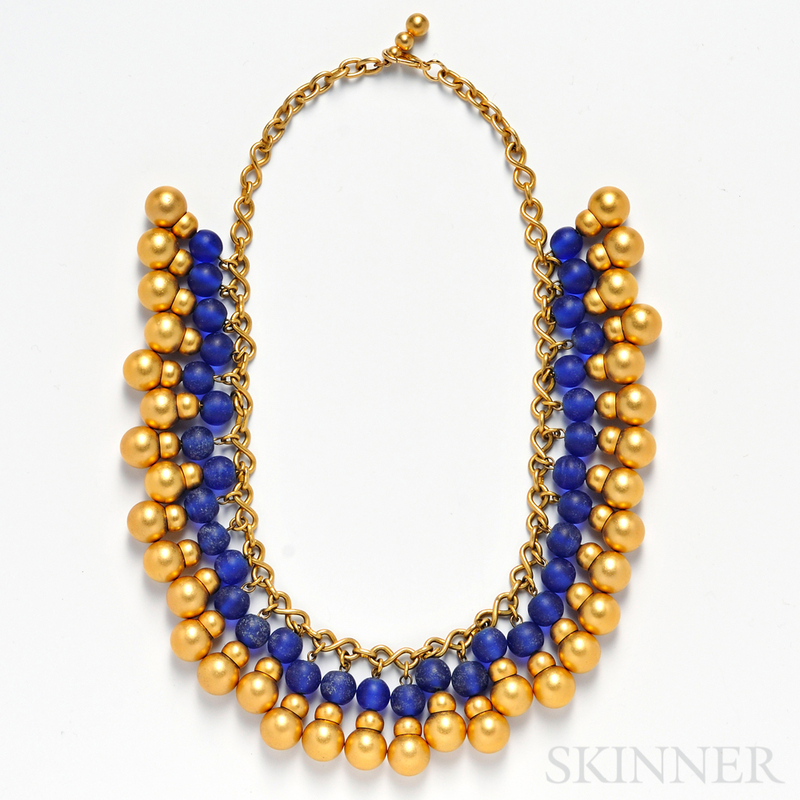 Announces First Online Fine Jewelry Auction | Skinner Inc.
BOSTON, MA – April 22, 2015 – Skinner, Inc. is pleased to announce its first ever online auction devoted entirely to Fine Jewelry. Beginning on Thursday, April 23rd and running until Thursday, April 30th, the sale will offer nearly 200 lots and feature some of the biggest names in jewelry, including Cartier, Hermès, Chanel, Van Cleef & Arpels, Robert Lee Morris and many more. 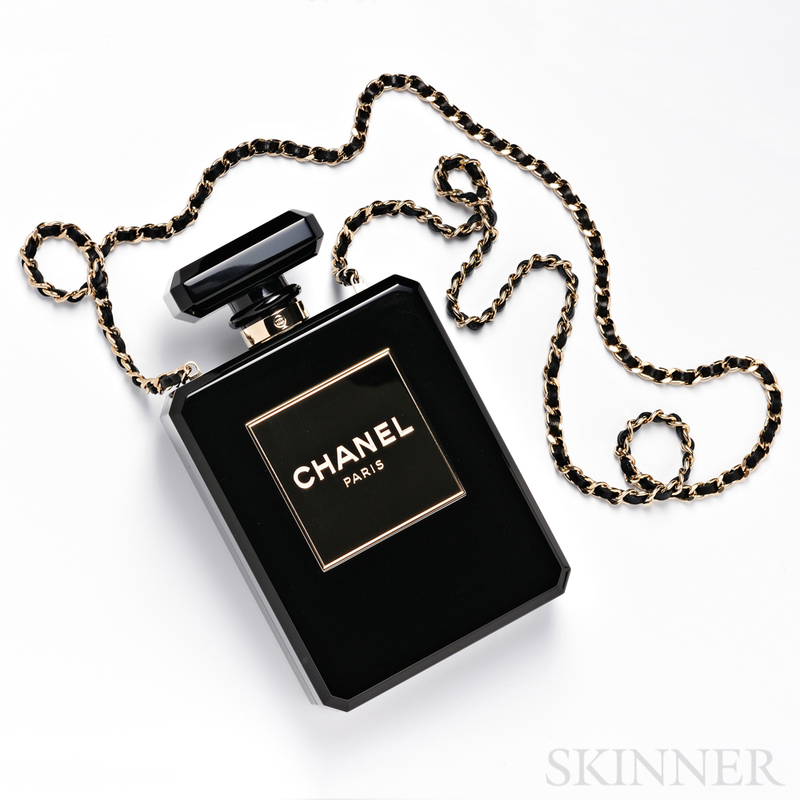 Skinner is pleased to offer a Chanel perfume bottle bag, designed by Karl Lagerfeld and donated by Gisele Bündchen to benefit the non-profit organization, REACH Beyond Domestic Violence (Lot 1041, estimated between $3,000 and $5,000). Bündchen, as the face of Chanel’s most recent spring campaign, and was given this bag as a gift. REACH provides safety and support to survivors of abuse while engaging communities to promote healthy relationships and prevent domestic violence. Another fabulous bag in this auction is a Hermes brown lizard “Kelly Pochette” handbag, complete with sleeper bag and box (Lot 1040, $1,500 to $2,000). 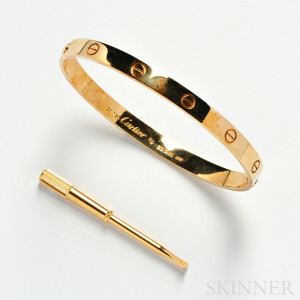 A robust selection of Cartier watches and jewelry are available in this sale. Standout watches include an 18kt gold “Panthere” wristwatch (Lot 114, $4,000 to $6,000), and an 18kt gold and diamond “Panthere” wristwatch, (Lot 1191, $5,000 to $7,000). Cartier necklaces, such as an 18kt white gold and diamond pendant (Lot 1160, $1,500 to $2,000) and an 18kt white gold gem-set “Meli Melo” necklace (Lot 1164, $4,000 to $6,000) are on the block, in addition to two “Love” bracelets, one in 18kt gold (Lot 1141, $2,000 to $3,000) and the other in 18kt white gold and diamond (Lot 1161, $3,000 to $5,000). A nice grouping of early pieces by artist jeweler and sculptor Robert Lee Morris will be offered, showcasing Morris’ evolution as a jewelry designer. An exciting pair of “Gamma” cuff bracelets in gold-tone metal is sure to please buyers (Lot 1057, $800 to $1,200). Morris’ fringe necklace, complete with freshwater pearls suspending gold-tone metal feathers (Lot 1061, $600 to $800), boasts a fascinating design, as does a fringe necklace of blue African glass and gold-tone metal beads (Lot 1058, $600 to $800). Beautifully-crafted jade pieces will make an appearance, including a pair of 18kt white gold, jade, and diamond earpendants (Lot 1139, $3,000 to $4,000). A distinctive 14kt gold and four-color carved Jade pendant from Gumps is a stand-out piece in green, white, yellow, and brown, depicting a foo dog with flower and bat motifs (Lot 1039, $500 to $700). This piece also arrives with the catalogue page from Gumps, indicating that the pendant retailed for $5,400. A lovely set of 18kt white gold, dyed chalcedony, sapphire, and diamond earclips by the Aletto Bros. will delight buyers (Lot 1177, $3,000 to $5,000). Additional diamond highlights include an 18kt gold, diamond, and gem-set flower brooch set throughout with full-cut diamonds, the center set with emeralds and rubies (Lot 1001, $4,500 to $5,500), and an attractive Van Cleef & Arpels diamond ring, set with five baguette-cut diamonds and diamond melee along the shoulders (Lot 1030, $3,000 to $4,000). View the catalogs online at www.skinnerinc.com/auctions. Each lot is available to view in person, and specialists welcome previewers’ questions in person, via phone, or email regarding auction material or the auction process, an experience distinctively designed to be rewarding for clients. Previews for Fine Jewelry – Online will be held on Tuesday, April 28th from 12 P.M. to 7 P.M. and on Wednesday, April 29th from 12 P.M. to 5 P.M. View driving directions.